Purpose: To evaluate haemodynamic changes during dental checkups and preventive treatments and establish the relationship between haemodynamic parameters and psychometric tests. Materials and Methods: Seventy-one paediatric patients (39 boys and 32 girls ages 6 to 14 years, mean age 8.04) scheduled to receive dental procedures fulfilled the inclusion criteria for this prospective study. Anxiety was measured at three time points by using the following haemodynamic parameters: heart rate (HR), systolic and diastolic blood pressure (SBP and DBP) and oxygen saturation (SaO2). The Children's Fear Survey Schedule Dental Subscale (CFSS-DS) and the Facial Image Scale (FIS) were used as psychometric tests before and after child attendance, respectively. Results: Variations in HR and BP during dental procedures were statistically significant while SaO2 values were not. The highest mean HR, SBP and DBP values were obtained during dental procedures, while the lowest SBP and DBP were recorded at baseline. HR and BP changes (r = 0.32, P < 0.01) were statistically correlated. The most anxious children based on both CFSS-DS and FIS scales also had the highest mean HR. Changes in BP and oxygen saturation parameters were found to have no relationship with anxiety groups in either scale. Conclusions: Dental checkups and preventive treatments cause significant changes in HR and BP. However, the CFSS-DS questionnaire does not adequately predict these changes. Mohebbi, Simin Z. / Virtanen, Jorma I. / Vehkalahti, Miira M.
Purpose: To determine changes in oral health behaviour following low-cost oral health education among mother-child pairs. Materials and Methods: In this controlled trial, interviews were conducted in a random sample of mothers of 12- to 15-month-olds (N = 242) attending the vaccination offices of public health centres in Tehran, Iran, and the vaccination staff provided oral health education for the mothers belonging to two intervention groups (A and B) and a control. Groups A and B received health education, but group A additionally received two reminders during the 6-month follow-up. The control group received no health education. The mothers' oral health behaviour and practices with regard to their children were scored at baseline and at the end. Changes in these scores were recorded separately for the mothers and the children and grouped into the categories prominent, minor or no improvement. Statistical evaluation was performed with the chi-square test, ANOVA and logistic regression. Results: Prominent improvement in oral health behaviour was evident in 45% of the mothers and 66% of the children in group A, 29% of the mothers and 31% of the children in group B and in 11% of the mothers and 21% of the children in the control group (P < 0.001). A prominent improvement in the mothers' practices with regard to their children was related to the mother's own behavioural improvement (OR = 1.3). The intervention was most successful in group A (OR = 5.1). Conclusion: Improvement in mothers' oral health behaviour can lead to improved health practices with regard to their children. Oral health education combined with external motivation is a valuable tool for promoting oral health behaviour in mother-child pairs. Saied-Moallemi, Zahra / Murtomaa, Heikki / Virtanen, Jorma I. Purpose: To determine the role of pre-adolescents' conceptions in improving their oral health in a school-based health education programme. Materials and Methods: A school-based programme was designed as a 3-month intervention study for a representative sample of 9-year-olds (n = 338) in 12 schools in Tehran, Iran. The schools were randomly assigned to the intervention groups and controls, separately for boys' and girls' schools. Children (n = 222) underwent two kinds of oral health education programmes. The control group (n = 116) had no intervention. Positive changes in the child's oral health conceptions were evaluated after the programme as determinants of each child's oral health. Final effects of the intervention were assessed as improvements in gingival health when all index teeth with bleeding at baseline became healthy (healthy gingiva). Statistical analysis included chi-square, independent samples t-test and logistic regression models. Factor analyses were applied to the child's oral health conceptions. Results: Three factors regarding the children's oral health conceptions emerged. After the programme, boys and girls in the intervention group experienced fewer barriers to dental care than did the controls. Healthy gingiva was apparent among the boys (OR = 2.0) and the girls (OR = 4.1) in the intervention group. Girls experienced fewer barriers to dental care after the programme (OR = 1.5) and achieved more healthy gingiva, but boys' oral health conceptions showed no effect on the health of their gingiva. Conclusion: In designing health education programmes, in addition to other determinants, pre-adolescents' oral health conceptions deserve consideration. Intervention planning necessitates awareness of gender differences. Purpose: To determine the prevalence and intensity of oral impacts on daily performance in 20- to 50-year-olds attending the dental clinic at Tehran Dental School and to investigate the association between the Oral Impacts on Daily Performance (OIDP) score, self-reported oral and general health and clinical findings of oral health. Materials and Methods: The study population comprised 20- to 50-year-olds attending the dental clinic before receiving any treatments. Data were collected using questionnaire-led interviews and clinical examinations. The questionnaire consisted of a validated questionnaire of the Persian version of the OIDP index, sociodemographic characteristics and self-reported general and oral health of subjects. The number of teeth, prosthetic status and the decayed, missing and filled tooth score (DMFT) were recorded according to WHO criteria. Statistical analyses were performed by Wilcoxon test and linear regression modeling. Results: A total of 499 individuals participated in the study. Among the subjects, 82.6% had experienced one or more oral impacts on their daily activities, and 49.5% of impacts were reported to be of severe or very severe intensity. Eating was the performance most frequently affected (50.1%) followed by smiling (16.2%) and sleeping (11.8%). The OIDP score was higher in the participants with a lower wealth index (P = 0.015) and in those with more decayed teeth (P = 0.013). The association between self-reported oral health and OIDP score was of borderline significance (P = 0.05). Conclusion: Oral health status has an enormous impact on the daily performance of Iranian adults attending the dental care center. More emphasis on oral health care in disadvantaged populations, particularly in countries with a developing oral health system, is required. Purpose: To investigate the prevalence and associated factors of traumatic dental injury (TDI) among 5- to 16-year-old schoolchildren in Bangalore City, India. Materials and Methods: In this cross-sectional study, a probabilistic sample of 2,140 schoolchildren was administered a questionnaire and examined intraorally to record TDI using the Ellis classification. Descriptive statistics and regression models were used for analysis of the data. Results: The prevalence of TDI among 5- to 16-year-old schoolchildren in Bangalore City was 9.7%. Boys (12.2%) were affected more than girls (7.1%). About 85% of the injuries occurred in maxillary anterior teeth and 89% in the permanent dentition with fractures in enamel as the most common type of TDI. Unknown causes accounted for 53.6% and falls (36.7%) were the most common reported cause. Only 3.9% of children with TDI had sought treatment. Children from public schools aged less than 10 years and boys had significantly higher TDIs as compared to private schoolchildren, those over 10 years of age and girls. Conclusion: The present study revealed a moderate prevalence of dental trauma. An emergent problem such as TDI should be met by public health policies that emphasise the prevention of TDI based on the knowledge of the risk factors. Children, parents and schoolteachers should be educated about the prevention and timely management of dental trauma in children. Purpose: To quantify changes in pH, buffering capacity and hydrogen carbonate, phosphate, protein and urea concentrations of stimulated saliva which occur during a 30-min measurement delay after saliva collection. The correlation between time-related chemical changes and changes of salivary pH and buffering capacity was assessed in order to explain the observed changes in salivary pH and buffering capacity. Materials and Methods: Stimulated saliva samples were collected from 30 volunteers after inducing salivation by chewing a piece of parafilm. Measurements of salivary variables were made immediately after saliva collection and again 30 min later, during which time the specimens were exposed to the atmosphere in collection cups at room temperature. Results: Postponement of measurements resulted in a significant increase in pH and a significant decrease of buffering capacity, phosphate and urea concentration. The results suggest that the time-related pH increase could primarily be attributed to loss of dissolved carbon dioxide from saliva, and confirm the importance of hydrogen carbonate in the neutralisation of hydrogen ions, but they do not support the principle of catalysed phase-buffering for the hydrogen carbonate buffer system in saliva. A decrease in phosphate and urea concentration affects salivary buffering capacity. Conclusion: This study emphasises the importance of the standardisation of measurement time when measuring salivary pH, buffering capacity, phosphate and urea concentrations following the collection of saliva in order to obtain comparable results. It also provides a partial explanation of the mechanisms underlying the observed changes of pH and buffering capacity over time. Purpose: To evaluate the effect of two products for the chemomecanical removal of carious tissue (Papacárie and Carisolv) on human dental pulp fibroblasts and the synthesis of extracellular matrix proteins. Materials and Methods: Fibroblasts were divided into three groups: group 1 (control), group 2 (Papacárie) and group 3 (Carisolv). Collagen I, III , fibronectin and osteonectin were analysed by immunofluorescence and compared among the groups. Results: The groups exhibited similar immunolabeling for vimentin, type I collagen and fibronectin, but were negative for type III collagen. Osteonectin staining was strongly positive in the cells treated with Papacárie and Carisolv and weakly positive in the control group. Conclusion: The findings of the present study showed that Papacárie and Carisolv are not cytotoxic to pulp fibroblast cells. Moreover, these products stimulate fibroblasts to produce osteonectin, likely leading to the formation of dentin matrix. These findings confirm the safe, beneficial use of both gels in minimally invasive techniques. Purpose: To evaluate the effect of preventive oral hygiene measures on the development of new carious lesions. Materials and Methods: Children regularly and irregularly attending recall appointments in a paediatric dental clinic were interviewed regarding their preventive measures performance. Newly developed carious lesions were also recorded. The files of 651 children were analysed. Results: A significant negative correlation was found between newly developed carious lesions and total number (P < 0.001) and frequency (interval in months to the next dental examination) of recall appointments (P = 0.021), regular toothbrushing twice a day (P < 0.0001), regular brushing in the evening (P < 0.001), high fluoride concentration in toothpaste (P < 0.0001) and drinking water between meals (P = 0.015), but not with regular brushing in the morning or eating more than 6 times a day. Multivariate analysis revealed three of the variables independently correlated with the development of new carious lesions: brushing regularly twice a day, concentration of fluoride in the toothpaste greater than 1100 ppm and frequency of follow-ups. Conclusions: Regular toothbrushing twice a day is of high importance for caries prevention. Fluoride concentration of > 1100 ppm in toothpaste should be recommended for children (considering the child's age) in order to maximise the fluoride protective effect. The importance of attending periodic recall appointments in order to maintain long term oral health should be emphasised. Purpose: To describe the prevalence of early childhood caries (ECC) by reviewing published reports and to assess the role of background factors in ECC prevalence. Materials and Methods: The studies included here consisted of reviews, meta-analyses and randomised clinical trials (RCT) which assessed the prevalence of ECC and included more than 100 subjects and subjects without any stated medical condition. These were in vivo studies published between January 1, 2000 to May 31, 2011. The patients' age range for inclusion was zero (0) to five (5) years of age. Results: Database searching showed 411 findings as potentially eligible. After abstract review, eight (8) papers were retrieved as full text and assessed for eligibility: three using ECC as mesh word, four using the term early childhood caries and one using severe-ECC (S-ECC) as mesh word. Conclusion: The main risk factor for ECC is the low socioeconomic status of the parents. ECC is a public health problem and it requires the involvement of all health professionals that provide care to children together with efforts from family members. Purpose: The aim of this cross-sectional study was to determine whether type 2 diabetes is coupled with increased severity of periodontal destruction. Materials and Methods: A total of 80 subjects with type 2 diabetes and 78 healthy control subjects underwent a fullmouth periodontal examination. The study included dentate subjects with a minimum of 7 remaining teeth in each dental arch. Plaque score, bleeding on probing and clinical attachment loss were assessed. Results: Diabetic patients showed a significantly lower percent of plaque-positive surfaces (P = 0.02) with a significant increase in the number and the percent of sites with clinical attachment loss ≥ 3 mm compared to controls. In the logistic regression analysis, age and diabetes were found to be associated with having > 15% sites with clinical attachment loss > 5 mm. There was a significant correlation between diabetes duration and the severity of periodontal attachment loss. Conclusion: Patients with type 2 diabetes were at higher risk of having severe forms of periodontal disease compared with non-diabetic subjects. The results highlight the need for frequent supportive periodontal care for patients diagnosed with type 2 diabetes mellitus. Purpose: To investigate the association between maternal periodontal disease and its effect on haemoglobin levels and low birth weight infants. Materials and Methods: This observational study included 770 mothers. Data regarding the periodontal status, pregnancy outcome variables, haemoglobin levels (Hb%) and other factors that may contribute to adverse pregnancy outcomes were collected. The data were analysed using the chi-square test and univariate logistic regression analysis. 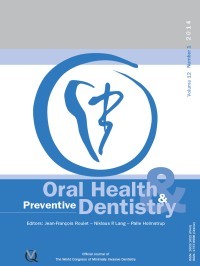 Results: Factors such as literacy (P = 0.002), adverse oral habits (P < 0.001), dental health negligence (P < 0.001), obstetric history (P = 0.001) and Hb% (P < 0.001) showed a significant association with periodontal disease. The study showed only seven mothers had not received antenatal care (ANC), which reflected the awareness of ANC during pregnancy. The reduced haemoglobin levels had an association with the severity of periodontal disease. The univariate logistic regression analysis indicated that mothers with a probing pocket depth (PPD) > 6 mm (OR = 2.21, 95% CI [1.07-4.55], P = 0.032) had a higher risk of giving birth to low birth weight infants. Conclusion: Periodontitis significantly influenced low birth weight. The increase in the severity of periodontal disease was associated with an increased rate of pre-term infants. The severity of periodontitis influenced the maternal haemoglobin levels, i.e. more severe peridontitis was associated with lower haemoglobin levels. Severe anaemia and periodontal infection may have an adverse effect on pregnancy and fetal development.